125 products available for 10-day trial & 370 single strips samples available. 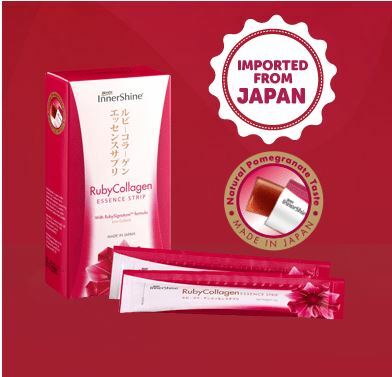 Experience skin rejuvenating power of RubySignature(TM) formula in delicious, convenient jelly strips that complement women on-the-go. Unlike other collagen products, our RubySignature(TM) formula is created with a precious blend of ingredients derived from natural sources. Experience skin rejuvenating power in just 6 weeks! Ideal for women between 30 to 45 years of age concerned with ageing skin, and women who are constantly on the go. Best way to consume: 2 strips daily (Only 19kcal per strip). This product should be consumed straight after opening. Taste delicious and melts easily in your mouth! Makes my skin glow and radiant after consuming the collagen essence! Packaging: simple, nice color and most importantly is very convenient. Can be simply slot in the bag. Taste: I love it to be chilled hence I put in the fridge before taking it. The taste is very fruity and is in jelly form. Like goes back to 90s eating the jelly which we buy from school or outside store. Personally I dun like sweet stuff yet this taste perfectly not too sweet. I took it before sleeping and next morning wake up while washing the face I realise there’s slight difference with just a single packet. My skin is more radiant and bouncy feeling. The product is good like the normal collagen jelly. But with just 1 strip for trial, I can’t really see the difference. Great product love have already ordered more. I saw a difference in my face. Taste good and smooth. And I am going to try to take them daily to see if there is any results . One packet for trial I guess it’s not enough to make a accurate review on skin. But taste wise , I just love it.